The Port Authority of New York and New Jersey says the building will stand 1,776 feet tall when the spire pieces plus a steel beacon are lifted into place. NEW YORK — One World Trade Center already is New York’s tallest building. Monday’s postponed celebration of the reconstructed trade center was to come days after a grisly reminder of the terror attack that took nearly 3,000 lives: the discovery of a rusted airplane part wedged between a nearby mosque and an apartment building — believed to be from one of the hijacked planes that ravaged lower Manhattan. As officials prepared to erect the spire, the office of the city’s chief medical examiner was working in the hidden alley where debris may still contain human remains. 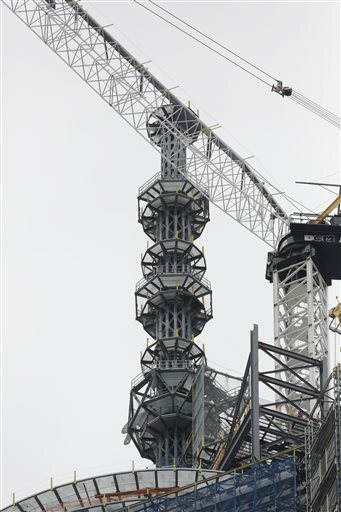 The new tower’s crowning spire is a joint venture between the ADF Group Inc. engineering firm in Terrebonne, Quebec, and New York-based DCM Erectors Inc., a steel contractor. The tallest building in the Western Hemisphere is the Willis Tower in Chicago. The world’s tallest building, topping 2,700 feet, is in Dubai.